You can purchase the full PDF printable pattern to have a full step by step photo pattern with actual pieces to cut out in 5 sizes for those that don't want to just hack out pieces on your own. This was a last minute project. It kind of popped in my head from nowhere. Usually I'm inspired by a fabric, or I'm trying to duplicate something or there's a series of ideas that lead to a project. But this dress kind of just came to me, and I had a night where my kids were in bed and my husband was at worked and it came together fast. 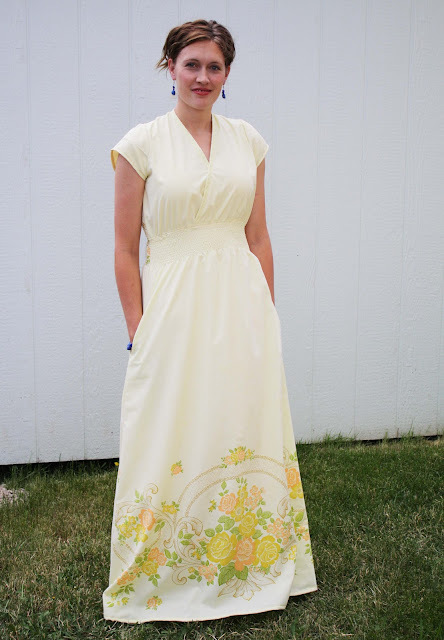 Once I sorted in my head how I wanted a full length maxi dress, I realized all the fabric it would require. Then I realized a sheet would be large enough and light weight rather than buying yards of fabric. I happened to have this yellow sheet with the unique floral design just at the top. So this is basically how the large skirt pieces were cut out. 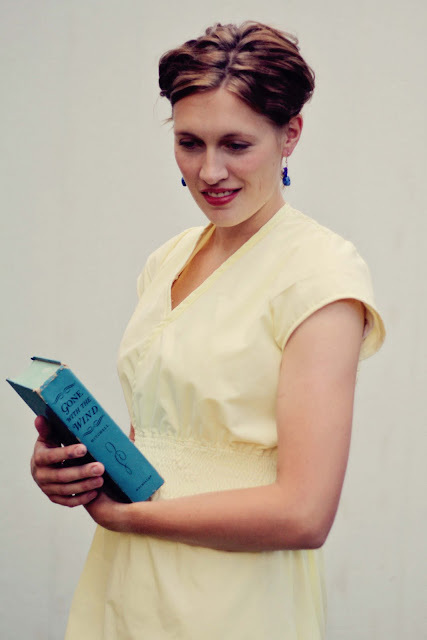 The bodice and sleeves were squeezed in from the surrounding scraps. But in this hack job, the dress turned out great I think, and I really love it. Not everything I make I end up just loving. But so far this is one of those rare projects. I guess I just feel.....elegant. Kind of like Audrey Hepburn in My Fair Lady at the horse race...she looks like she fits the part and then she opens her mouth: "Come on Dover! Move your bloomin' ...."
I love it although it may not totally be "my style"....but I don't really have a style. With fashion, I'm pretty clueless and there's things I like and things I don't, but one thing is always important--it has to be comfortable. And this dress is really flowy and comfy. So more of the details. There are very few dresses I make with out pockets. Especially casual dresses/ skirts. If I plan on wearing the thing all day long, it's got to have pockets. I decided to take the skirt the whole way. All the way to the floor. I was trying it on before I put the sleeves on yesterday afternoon and my son saw me and said: "wow mom, yours dress is fancy." I think this is what makes it feel fancy. The full length skirt. It makes me think of the Regency England period or something. It actually may be a little too long. It just skims the floor, and as romantic as it looks, I don't want to be a swiffer pad, so I may hem it one more inch. It reminds me of the part in Pride and Prejudice where the Bingley sisters are criticizing Lizzie for having a hem 6" deep in mud...and I can see how that would happen really fast. For the bodice I used a sweater as a pattern. I like the funnel neck line. It crosses, but keeps the angle of the crossing closer together so you don't have cleavage. I made my own bias tape from the scraps to go around the neck so I wouldn't have to hem that curve or anything. The skirt attaches to the bodice, which I cut pretty wide, and it's all shirred in rows sewn in a spiral. This makes the bodice flowy and comfortable, but the waist is pulled in to give it some shape. But to me it feels like I'm just wearing a comfortable big sack. The back of the bodice is where I started getting down to a pile of scraps. I had to use the sides of the sheet that had the floral print on them. I did my best to match them up so it looked intentional, rather than using scraps just to get by. The above picture you can also see the crease on the sleeve really well. That's because I totally ran out of sheet and still needed to add sleeves. Originally I had planned to make almost elbow-length flutter sleeves...but I had almost zero fabric left. So I was down to a simple cap sleeve out of the sheet cuff. So I had to cut open the cuff and since it's been folded and worn for decades, ironing it flat never really took the imprint of the fold out. Maybe with time it will flatten and be less noticeable. But there were virtually no scraps left on this dress, I had to use every morsel of the sheet...so a twin flat sheet on a big girl really cuts it close. So from the side you can see the front of the skirt has the floral, the back of the skirt is plain yellow. Where the front of the bodice is plain yellow, and the back of the bodice has the floral. Kind of weird how that ended up. But I didn't want to mess with the floral on the bodice front because it was overlapping. So it seems a little more "fancy" than it really is, just a sheet with an extra long skirt. I know most people probably wouldn't wear this dress just to kick it with the kids or run errands. But I will, because it's comfortable, and no one can see my hairy legs...and it does make me feel a little thinner and prettier even though it will have baby spit-up and gooey hand print on it by lunch just like all my other clothes. Celebrities pump gas in long yellow maxi dresses, so I wouldn't be the first. Anyway, I wore it for the 4th of July and it didn't get in the way and we had a great holiday yesterday, hope the other Americans reading this did too. Our little family enjoyed good food and a perfect view of fireworks, it was kind of a magical night. Oh.my goodness. Do I love this or what? You are brilliant! I have learned cool things from following your blog...like the whole shirring thing...now to just DO them! Well done Jessica! Your ingenuity is a wealth for your closet. Keep up this inspiring creativity. Oh, I love this! I've sort of been wanting a maxi-dress, too. Better poke around the linen closet. :) I like how the floral ended up on the skirt front and back of the bodice. It's all so beautiful. Nice work! You look so great in this dress. I'm all for playing in pretty clothes, whats the point of having nice stuff if you don't use or wear it? And I guess since it is made from a sheet it will be easy washable. By the way have you ever looked at this site? You nailed it. That dress is absolutely all of those things, fancy, playful, feminine. Perfect!! Great job on this, I have been thinking alot about maxi dresses. It looks great and love the My Fair Lady reference. Do you have any thoughts on where a maxi dress should be hemmed to? I recently purchased two dresses, which will require some hemming. It seems most people wear them with some sort of gladiator sandals (flats), or others some sort of wedge heel, like an espradrille. Still trying to figure out where to cut. I found your blog via Craft Stew, and I've been following it for a couple weeks now. I love it!!! Excellent reference to Pride & Prejudice, btw! I love this dress! Your hair looks so beautiful in all these pictures too! You are so talented! It's beautiful!!! Looks so comfy too! 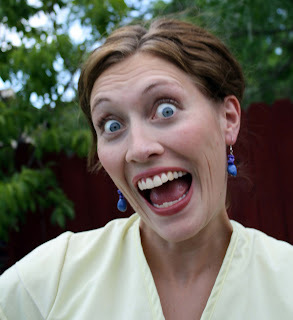 I'm new to your blog, and I just wanted to say that you, that dress, and your whole blog are adorable. I'm at the very beginning with sewing, and I can only hope to be that good someday. LOVE and ADORE this maxi dress! It is acutally the cutest one I've seen!!!! I love the cap sleeves, instead of spaghetti straps!! good job! I love maxi dresses, and this one is GORGEOUS!! You are so amazing. And funny. I am just breathless. It is SO flattering, comfy, practical, efficiently made -- all things I highly value in a handmade item. But then it's GORGEOUS to boot. I love it and am super-jealous that I don't own one myself. the dress is fabulous and you look GORGEOUS! That dress is wonderful! As much as I fear making clothing, I think this may push me to try again. I absoultely love it! Great Job! You'll have to share what thrift store you find all these things at! I love it and it looks great on you! This dress is incredibly beautiful. I would love to be able to just up and make something like this from a sheet. You look so lovely in the pictures, too. Wow. That is so awesome and so creative! 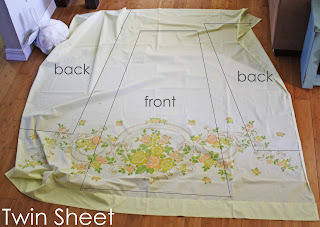 This is the type of project that would inspire me to sew more, and to perhaps get over my extreme fear of measuring! I love the added detail of the flowers on the back, even if you didn't plan to have them there at first. Gorgeous! This is the PRETTIEST maxi dress I've ever seen. I'm not really a fan of them, but yours makes me change my mind! LOVE it!!! Truly one of your best! I LOVE this, I bought great linnen with a yellow flower on it at the thriftstore!!! 6 meters for €4,75 AWESOME to make this dress out of the fabric...Great job on it using every scratch and piece of fabric!!!! I have found a kindred spirit! I collect linens, waiting for an inspiration to design and sew. My suggestion would be to check the length and tension of the seam stitches(especially the back seam)and press seams with a ironing block as you sew..allow cooling time. Can't wait for your next idea. You are far too modest, you look totally stunning in that beautiful dress :) Definitely a look I would aspire too... and Gone with the wind is my absolute favourite book! I admire your creativity and good taste! I am inspired to actually cut into my sheets.... I have so many that would be perfect for this kind of a dress. I love it! And you look completely stunning. Seriously. I love this & it looks fantastic on you. I'm the same way - I often wear skirts or dresses that may look dressy, but I just wear them because they're so comfy. I love the dress, looks so cute fun and comfortable. I know you made the pattern, you should make a paper copy of it. ARE YOU KIDDING ME??? You have outdone yourself with this one: SO STINKIN CUTE!! Can I order one? You. look. stunning. I could never pull that off! I love the neckline. Well done. Wow!!! Your dress looks amazing!!!! I love it!!!! so, so pretty! I sew with vintage sheets quite a bit, too. If you haven't tried it yet, spritz a little white viniger on the cuff line and iron it with steam, it should flatten it right out. it really is absolutely lovely! Hello! Found a link to you on pinterest and had to see just how "doable" this dress is! Looks fantastic -- and possibly like it might/could be conducive to nursing, in which case I know a bunch of mamas who would like it! May I please post a picture and link to this on my blog? (http://flowersroundthecross.blogspot.com) You can email me @ maiafromflower at g mail dot com. Much thanks! Oh My God, Your dress is Lovely!! I loved it! How very creative of u! Love this. It turned out very cute! Thanks for sharing. I may be brave enough to try this one. Love this dress!! Whether or not you think you are, you definitely look elegant and graceful in it! You look positively tiny :) Be thankful that you're well proportioned, dear! You are so talented! I love everything about this dress. The cap sleeves and the back pieces are perfect. It looks great on you too. You look amazing - the color suits you perfectly and I think I prefer with the cap sleeves anyways. Love your blog! Came over from craft gossip. Very cute and nicely done! I was looking for ideas for a friend and this is a good one. You are beautiful and the dress looks awesome on you! Well done. I agree with others that you are quite talented and can't wait to see your tutorial on this. I don't know if I have the gumption to tackle this myself. this is modest, beautiful and cheap!!! it's a triple threat! rose (my 16 y/o) can't wait to make this. So so so pretty. I love how you made sure to get some flowers on the back of the bodice. Very nice. You definitely look elegant! I am having a Rachael Zoe moment! I DIE!!!!! I love it! I would love to feature this on Reduce, Reuse, Upcycle. Feel free to stop by and grab a featured button. Thanks! Your dress is beautiful, you look amazing. I love the idea, I love recycling. That is sooooo nice! I love that sheet and it suits the project so well. This would also be great in a jersey fabric, don't you think? So clever. Thanks for sharing. So flattering and such a great use of this kind of patterned sheet. Lovely! I have been browsing on-line greater than 3 hours as of late, but I by no means discovered any interesting article like yours. It is lovely value sufficient for me. In my opinion, if all site owners and bloggers made just right content material as you probably did, the web can be much more useful than ever before. I LOVE LOVE LOVE this dress tutorial! I am doing a small roundup of some of my favorite tutorials and was wondering if I could use yours as well as your image for it. This is perfect for another summer! I did a little maxi dress series and would love if you linked up your dress! What a great dress! And I have the perfect sheet for such a project. Thanks for sharing. Found you through a pin on pinterest. Have a beautiful day. Love it! Time for me to do some sheet hunting at the Goodwill. :) PS, You are no where NEAR a big girl! Are you crazy?! You are beautiful! I just googled Maxi dress patterns and I found your blog, oh my goodness, you are beautiful and I'm in LOVE with this dress! But how did you make the waist? 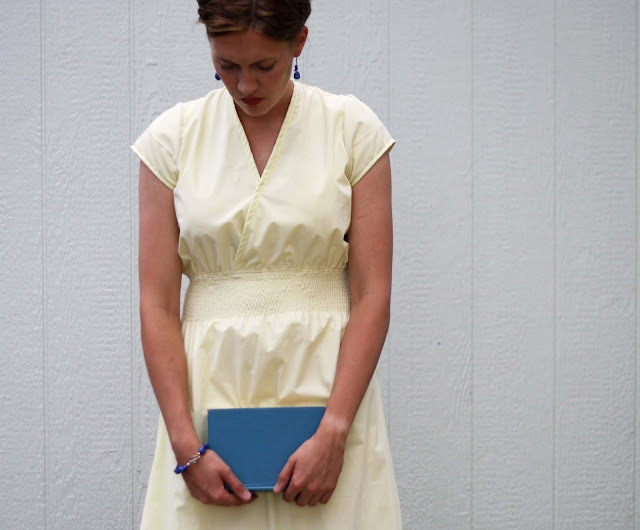 This dress makes me want to go scour thrift shops for pretty vintage sheets!! The technique is called shirring and involves thread from elastic. It's in the bobbin or bottom thread and scrunches the waist in. I am getting the extra sheet set we never use immediately! I could use a cute new dress. Loved your "I feel elegant, but I'm not really", thing. I bust up laughing when I read it. I recently tried this dress and like it. However, even after adding to the bustline for cup size, I will have to add to the side of the bodice, as this dress has absolutely NO ease. If you're bustier, and like ease, remember to add a little. Wow! It's amazing. I'd wear it all day too. Just wondering if you, or anyone else, has made this in a knit? Do you know how it would work? I haven't personally, but I've had readers who have. Some nursing moms made the bodice from knit (size down in the width to accommodate the stretch of your knit) and the skirt from a woven. It would also work with the whole dress in a knit. Wait, I have sewn it in a knit here: I used a ponte roma knit that doesn't have much stretch, I'd guess it's around 10% across the grain, and so I didn't size down since the stretch was minimal. I am nursing right now, and am currently making a nursing/maternity pattern from Megan Neilson. It has a crossover bodice, and it reminded me a little of this one. I had bought this pattern a while ago and just haven't gotten around to making it yet. I guess I'll have to just try it. Thank you. What a pretty dress! Can you tell me before I buy the pattern how much fabric I'll need if I'm not using a sheet? Thanks!